What do you doubt about God? If you have any faith in God, you surely wrestle with doubt as well. In a world where innocent Marathon runners and spectators become terrorist victims one day and innocent plant workers become victims of an explosion the next, doubt creeps in about a loving God. What kind of God does this to His people? What hope is there in this world? What do we have to cling to? The doubt in our heart is nothing new. The stains of doubt are never fully washed from our cup no matter how powerful our faith is. For as long as people have had faith they have wrestled against doubt. Take Thomas for instance – the doubting disciple. For the past few weeks I’ve been rehearsing for a play called “Eight Days After”. The play is an exploration into the mysterious appearances of Jesus after His resurrection and how they affected the people He once knew. In the play, Thomas refuses to believe Jesus has actually risen from the dead. I’ve had the privilege three nights a week of playing Thomas and looking Jesus right in the face. It’s something I wish everyone could do -not just read the words of the Bible, but play them out. To speak doubt directly to Jesus, and feel the comfort of His hand on your shoulder right afterward – it’s overwhelming. It seems amazing that Thomas had doubts. He was one of the 12 men closest to Jesus. He was an eyewitness to the miracles Jesus performed. He was one of the small group of people who lived on this Earth and spoke with Jesus personally. Thomas gets a bad rap though. Every one of the disciples had their doubts about Jesus. They all had moments questioning Christ. So if the disciples doubted, what hope is there for us? These men were just a few days removed from Jesus. We’re 2,000 years removed. We’ve never seen Jesus or heard Jesus or touched Jesus. How do we believe? Sometimes it’s easy to forget the biggest book of the Bible is a giant struggle with doubt. As David ran and hid and wrestled with his faith, he screamed out in agony to God. His doubts are the inspiration for the Psalms. He lets his fears fly from his pen across a hundred songs and poems. By giving voice to his doubts, David’s faith grew greater. He unleashed his frustrations and saw a God big enough to bear his criticisms. Our doubts and fears are no match for God. When we are honest with Him, He is honest with us. It may seem healthy to ignore your doubts. But that only makes them stronger. Letting doubt breath is the only way to suffocate it. Fear screams loud at first; if you let it scream long enough it will lose its voice. One of my favorite authors Jon Acuff recently launched a project called No More Voices. It’s an online sounding board for your doubts. You post (anonymously if you choose) what the voices in your head tell you about yourself or God. By giving voice to your fear you realize how small it is. Other members click the Me Too button and show you’re not alone with what you wrestle with. If you’re doubting God today, don’t panic. You’re not alone. Stay in the fight. Give God an earful. Then let him place his hand upon your shoulder. Your doubts may not disappear, but you’ll begin to see how weak they really are. What do you doubt about God? What do you doubt about yourself? How do you do battle with doubt? ** If you want to explore doubt and faith more, I’d be honored if you came out to one of our two performances of “Eight Days After”. 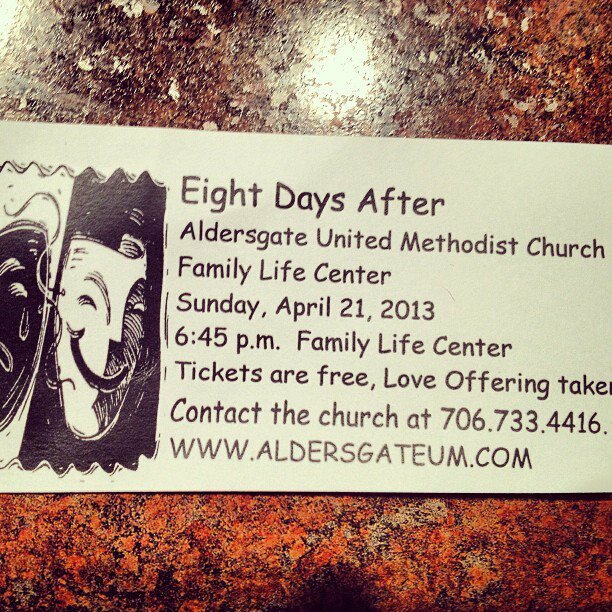 The first performance is Sunday April 21 at 6:30 PM at Aldersgate United Methodist Church on Wheeler Road. The second is Sunday April 28 at 6:00 PM at The Hill Baptist Church on Kings Way. Both performances are free of charge.